The Ministry of Justice of the Union of Soviet Socialist Republics (USSR) (Russian: Министерство юстиции СССР, Ministerstvo Yustitsii SSSR), formed on 15 March 1946, was one of the most important government offices in the Soviet Union. It was formerly (until 1946) known as the People's Commissariat for Justice (Russian: Народный комиссариат юстиции, Narodniy Komissariat Yustitsi'i) abbreviated as Наркомюст (Narkomiust). The Ministry, at the All-Union (USSR-wide) level, was established on 6 July 1923, after the signing of the Treaty on the Creation of the USSR, and was in turn based upon the People's Commissariat for Justice of the Russian Soviet Federative Socialist Republic (RSFSR) formed in 1917. The Ministry was led by the Minister of Justice, prior to 1946 a Commissar, who was nominated by the Chairman of the Council of Ministers and confirmed by the Presidium of the Supreme Soviet, and was a member of the Council of Ministers. The Ministry of Justice was responsible for courts, prisons, and probations. Further responsibilities included criminal justice policy, sentencing policy, and prevention of re-offending in the USSR. The Ministry was organised into All-Union and Union departments. The All-Union level ministries were divided into separate organisations in the Republican, Autonomous Oblast, and provincial level. The leadership of the Ministry of Justice came from notable Soviet law organisations from around the country. According to a decree from 1972, the Ministry of Justice prepared proposals for the codification of law; it carried out methodological management of legal work in the national economy. The Ministry directed and coordinated the work of state bodies and public organisations to promote legal knowledge and to clarify the law among the population about the judicial agencies, as well as general management of the civil registry, state, and legal profession. The Ministry was liable to the Party, the state, and the people. The Ministry's main goal was to strengthen socialist legality and the rule of law within Soviet judicial institutions. The Ministry was organised into one All-Union (USSR-wide) ministry and 15 Union ministries. The leadership of the ministry consisted of notable figures of the judicial authority of the Soviet Republics, the military tribunals, Bar members, notaries, and other judicial institutions. The leadership's task was to organise and prepare proposals for the codification of legislation. The organisational leadership, and the courts, had full control over the republican, autonomous, and provincial levels of government and the party. On 1 February 1923 the All-Union People's Commissariat for Justice was dissolved, and its responsibilities, duties, and functions were given to the Procurator General. The Department of the Procuracy of the Ministry of Justice, headed by a republican Procurator General, was responsible for limiting the powers of the Procurator General. On the grounds of stopping "unnecessary centralisation", the Ministry of Justice was dissolved both on the Union and the All-Union level. The functions of the Ministry was then handed to the Supreme Court and the Legal Commission of the Council of Ministers. The Ministry was reestablished in 1970 by the Alexei Kosygin government. Extensive regulations on the Ministry were created by the Council of Ministers. The Ministry's main task was to direct and supervise judicially organs, both at the Union and All-Union level, according to a decree from 1975. The main task of the Ministry was to develop proposals on issues linked to the judicial system; the election of judges, elect the judiciary, organising the judiciary, studying and summarising of the jurisprudence in coordination with the Supreme Court, and to organise work for the maintenance of judicial statistics. According to Soviet law, the Ministry could propose various measures to improve the Soviet court system. According to Article 1 of the People's Commissariat for Justice, the commissariat's main task was to supervise the legal activities of the Soviet central agencies and the people's procurator. The Ministry of Justice was headed by a Minister who was elected by the Presidium of the Supreme Soviet between seasons, and authenticated by a Supreme Soviet convocation. Deputy Ministers were elected by the Council of Ministers; allocation of the deputies was decided by the Ministry of Justice. Each deputy usually headed his or her own department. The minister, the deputies, and other senior officials formed the leadership circle, known as the Board of the Ministry of Justice. The members of this board were approved by the Council of Ministers. The Board of the Ministry held meetings regularly to discuss legal matters nationwide. Decisions made by the board were as a rule implemented nationwide. If the board disagreed they sought the assistance of the Council of Ministers to solve the problem. The structure and number of employees of the Ministry were approved by the Council of Ministers. Staffing of the central apparatus of the Ministry, as well as provisions of the departments and divisions, were approved by the Ministry of Justice. The seal of the Ministry of Justice was the state emblem of the USSR. We are sometimes up against a flat refusal to apply this law rigidly. One People's Judge told me flatly that he could never bring himself to throw someone in jail for stealing four ears. What we're up against here is a deep prejudice, imbibed with their mother's milk... a mistaken belief that people should be tried in accordance not with the Party's political guidelines but with considerations of "higher justice." According to Abdurakhman Avtorkhanov, Nikita Khrushchev abolished the Ministry during the height of the Khrushchev Thaw in an attempt to restore the "Leninist norms of socialist legality" which had disappeared under Joseph Stalin's rule. Khrushchev tried to make the Soviet court more independent from central authority by enforcing the 1936 constitution on the country's judicial branch. This would, according to Khrushchev, give the courts further independence from the central authority. The functions, duties, and responsibilities of the Ministry were reassigned to the Supreme Soviet and the Legal Commission of the Council of Ministers at all levels of Soviet society. By the 1960s it became clear that these reforms were not working as planned, and the ministry was reestablished by the Alexei Kosygin government in 1970. The Ministry, along with the majority of other Soviet ministries, was supposed to be abolished in December 1991 on the orders of the State Soviet, this did not happen, and the Soviet Union dissolved itself before this date. ^ a b c Government of the USSR (21 March 1972). УКАЗ: ПОЛОЖЕНИЕ О МИНИСТЕРСТВЕ ЮСТИЦИИ СССР [Decree: Position of the Ministry of Justice of the USSR] (in Russian). pravo.levonevsky.org. Retrieved 14 October 2010. ^ a b Government of the USSR (12 August 1971). 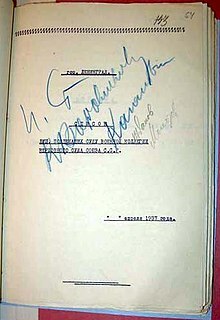 УКАЗ: ПРЕЗИДИУМА ВЕРХОВНОГО СОВЕТА СССР [Decree: Presidium of the Supreme Soviet of the USSR] (in Russian). Moscow: State Duma. Archived from the original on 23 August 2011. Retrieved 13 October 2010. ^ Ferdinand, Maria Feldbrugge Joseph (1992). The Emancipation of Soviet law. Martinus Nijhoff Publishers. p. 144. ISBN 0-7923-1436-0. ^ a b Morgan, Glenn G. (1962). Soviet administrative legality: the role of the attorney general's. Stanford University Press. p. 32. ISBN 0-8047-0143-1. ^ Szirmai, Zsolt (1975). Codification in the communist world. Brill Archive. p. 337. ISBN 90-286-0125-2. ^ Lenin, Vladimir. "On the Tasks of the People's Commissariat for Justice under the New Economic Policy". Marxist Internet Archive. Retrieved 14 October 2010. ^ Solomon, Peter H. (1996). Soviet criminal justice under Stalin. Cambridge University Press. pp. xvi. ISBN 0-521-56451-4. ^ Radzinsky, Edvard (2008). Stalin: The First In-Depth Biography Based on Explosive New Documents from Russia's Secret Archives. Paw Prints. p. 258. ISBN 1-4352-1196-0. ^ Avtorkhanov, Abdurakhman. Технология власти [Technology of power] (in Russian). bookz.ru. Retrieved 14 October 2010. ^ Yatskov, Anna. ИСТОРИЯ СОВЕТСКОГО СУДА [History of the Soviet court]. Notes of the Fatherland (in Russian). Retrieved 14 October 2010. ^ Government of the USSR. Президиумы судов и некоторые вопросы судоустройства [The Bureaux of the courts and some of the issues of the judicial system] (in Russian). Business Law Institute of the State University of Management. Retrieved 14 October 2010. ^ Government of the USSR. Об утверждении Указов Президиума Верховного Совета СССР об образовании и преобразовании некоторых органов государственного управления и о внесении соответствующих дополнений в статьи 70 и 78 Конституции (Основного Закона) СССР [On approval of the Presidium of the Supreme Soviet of the USSR on the formation and transformation of some government bodies and on making relevant amendments to Articles 70 and 78 of the Constitution (Fundamental Law) of the USSR] (in Russian). constitution.garant.ru. Retrieved 14 October 2010. ^ Government of the USSR. ОБ УПРАЗДНЕНИИ МИНИСТЕРСТВ И ДРУГИХ ЦЕНТРАЛЬНЫХ ОРГАНОВ ГОСУДАРСТВЕННОГО УПРАВЛЕНИЯ СССР [Abolition of ministries and other central organs of the union government of the USSR] (in Russian). businesspravo.ru. Retrieved 14 October 2010. This page was last edited on 30 July 2018, at 22:48 (UTC).